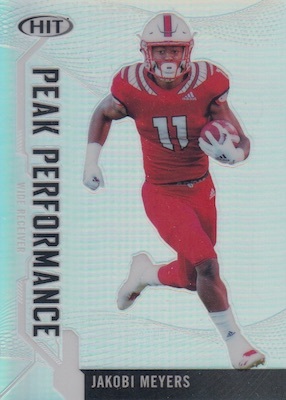 2019 Sage Hit Premier Draft Low Series Football provides an early look at some of the top NFL Draft prospects. Each Hobby box contains 12 autographs and Blaster boxes offer three autographs. Sage also teased mystery surprises and no redemptions. Upgrading from 2018, the cards in 2019 Sage Hit Premier Draft Low Series Football display UV coating, thicker card stock, foil-stamped subsets and full-bleed designs. 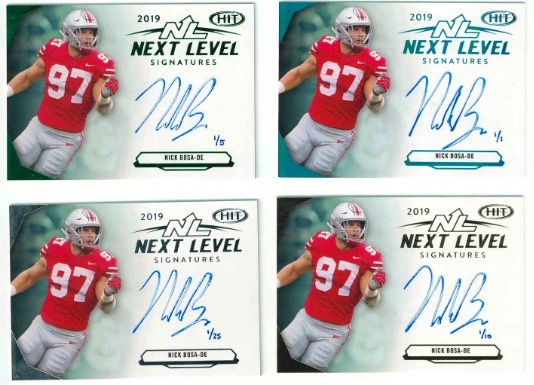 In addition, 2019 Sage Hit Premier Draft High Series Football expands the line into a second set. Enhancing the 70-card base set, every Hobby pack has an exclusive Gold parallel. Retail formats have an exclusive Silver parallel. 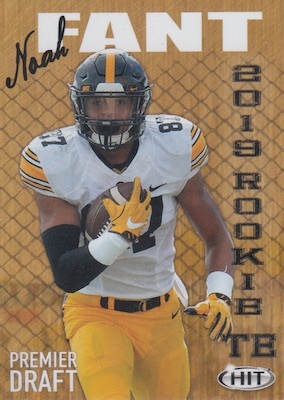 The 2019 Sage Hit Premier Draft Low Series Football checklist also features themed subsets and inserts. 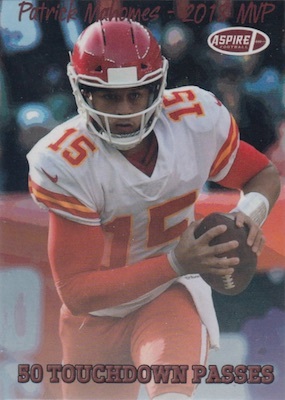 The Aspire set covers Patrick Mahomes this year. Other options include artist-rendered Instant Impact, revisiting notable 2018 NFL rookies, as well as Premium Portrait and chromium Peak Performance. As for the autographs, 2019 Sage Hit Premier Draft Low Series Football has Base Autograph cards with limited Gold (#/100) versions, plus signed versions of the Aspire, Instant Impact, Peak Performance and Premium Portrait sets. The foil Next Level Signatures cards are another choice, and most of the autographs come as low-numbered parallels, as well. Blue Ice is a new one-of-one edition. 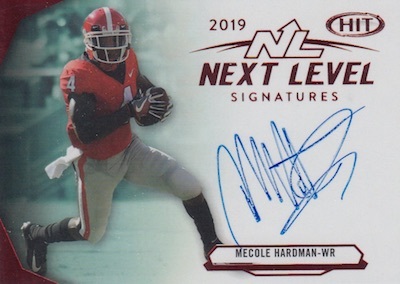 A nice bonus for 2019, the Next Level cards are hard-signed for the first time. Also debuting in 2019, random exchange cards are good for game-worn jerseys and signed jerseys from prospects. 2019 SAGE HIT Premium Portraits Autograph Green #PPA04 Devin White #5 5 LSU Hot! PARALLEL CARDS: Silver (Retail), Gold (Hobby). Buy 2019 Sage Hit autographs on eBay. PARALLEL CARDS: Black, Red, Gold #/100, Blue Ice 1/1. PARALLEL CARDS: Red, Silver #/25, Gold #/10, Emerald #/5, Blue Ice 1/1. PARALLEL CARDS: Silver, Red #/25, Blue #/10, Gold #/5, Cracked Ice 1/1. PARALLEL CARDS: Silver, Red #/25, Gold #/10, Blue #/5, Cracked Ice 1/1. Here are the top deals on blaster boxes currently listed on eBay. Awesome! We’re gonna see 2019 cards in February! Really excited to see the upgraded cards from Sage. How much do these usually MSRP for? Blasters are normally around $20 and Hobby is around $100. Is it just me or have we been staring at the same names on a checklist for about a million years. Any 2019 products with names of players yet to make it to any squad will be awesome. Keep an eye on my boy, Jared Stidham. I’ll go out on a limb and say he is drafted overall at the QB #4 or $5. I got a box this weekend. I love the new card stock and On-Card Autographs. Box say 12 Auto’s but I got 13 for around $100 cant beat it. I’m getting more. TBH my favorite cards are the Peak Performance cards love the serial Numbered versions. This is how the checklist was provided. Gaps will be filled in as they can be confirmed. Can you get the bonus hit in Retail Blasters or only in Hobby Boxes for the Jersey Memorabilia redemption cards. Also Are INSTANT IMPACTS & NEXT LEVEL cards #49-70 inserted the same as the base is in the retail. No word on whether on the Instant Impact or Next Level subset cards are short prints. The sales info listed the jersey exchange cards for both the Blaster and Hobby format but that is all we know. I have passed on Sage Draft cards the past 2 years & went with the much cheaper priced & looking Leaf Draft. I did buy a select few bigger name RC cards from Sage from eBay the last 2 years but not any blaster or hobby boxes. I decided to jump on these 2019 Low Series & got me a Hobby Box with the guaranteed 12 Autos. Well, just like someone else posted I received a total of 13 Autos. 8 of them are from what should be definite 1st Round Picks. The other 5 players have at least 2 that could be possibly 1st Round but more than likely 2nd Rounders. I also received over the 20 base parallels & 20 Inserts. I received 22 base parallels & 22 Inserts overall. Besides several pretty big name Autos & the parallels/inserts the next biggest cards I pulled were a “Next Level Signature” of Will Grier & also 1 Blue Peak Performance card (/5) of D.K. Metcalf & a Gold(Hobby only) Premium Portrait card of Marquise Brown. Well worth the money spent for the Hobby Box. I have always went with the Blaster Boxes for these very 1st Draft products (Leaf & Sage) but from now on I’m not fooling with the Blasters because the Hobby Boxes seem to be packed/loaded really well. I wouldn’t call what I received a “Hot Box” but pretty close to it. Thanks. My local Target finally got these in so I decided to pick up a blaster. The cards are legitimately far higher quality than previous years, using way thicker stock and a gloss coat that makes it feel like much more of a legitimate product instead of a cheap knockoff. The card design is also far better this year, looking like SAGE either hired a professional graphics designer or took a lot of time to get legitmately good at card design. 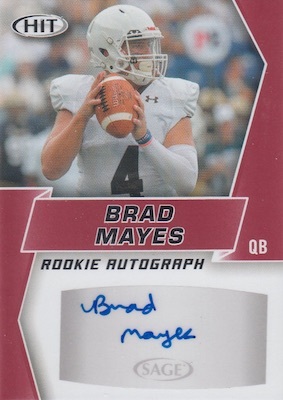 I got three no-name players out of my autos, but one of the cards was short-printed to 100 copies, and SAGE has said that all players are pullable out of blasters, so I think this product has a ton of potential if you’re looking for a quick fun rip with the 2019 class. Overall, massive improvement from previous years, and it shows SAGE could begin to take up more of the market share over time. Also got 13 autos in my Hobby Box. Hit a Bosa numbered to 100, got two Devin Singletary on base auto another /15 the rest where either mid rounders or training camp bodies. Way better than last years low series where I pulled a punter, yes a punter. A TE that had announced his retirement already and some scrub OL guys. The quality of the actual cards is MUCH better than previous years as well. 2019 SAGE HIT SERIES 1 FOOTBALL FACTORY SEALED HOBBY BOX 12 AUTOGRAPHS!